We can provide you with competitive tarmac quotations from our database of authorised installation companies around the UK. Whether you are looking to renew your driveway, footpath, playground or car park, this service is completely FREE. Complete our short paving quotation form TODAY to save money with Tarmac Paving Prices. 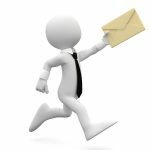 An Introduction to Tarmacadam – as if you needed it! Everyone is familiar with tarmac but it is a much underrated paving material. Tarmacadam is durable, long lasting and, being available in a wide range of colours and border options, can form an attractive driveway for the front of your home. Our installers offer the best Tarmac Paving Prices in the UK. Tarmacadam is ideal for driveways, patios, footpaths, car parks, playgrounds, tennis courts, industrial estates, roads and motorways. And for the homeowner, when block paving borders or coloured tarmacadam are used, tarmacadam can offer a very attractive alternative to Block Paving, Pattern Imprinted Concrete and Resin & Aggregate driveways. Driveway design is an important part of the installation process as it gives you an opportunity to completely change the frontage of your home. 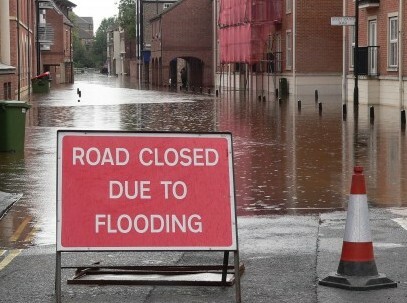 You may need additional parking spaces and perhaps a footpath to the side of your home. Taking time over the design also allows you to re-think the soft landscaping areas of your front garden. Mark out the new driveway area with a string line and wooden pegs, at this stage you can always make final adjustments. One of the advantages of getting several quotes is to listen to the ideas suggested by experienced driveway installers. Excavation of the existing surface to at least 180 mm below the proposed finished surface of the new tarmacadam driveway. The finished level of your new tarmac driveway should be at least 150 mm below the damp proof membrane on your house. 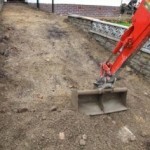 Excavation is usually by mini-digger and all spoil should be removed from your driveway to a registered landfill site. A geo-textile membrane may be required for your new tarmac driveway in some cases but not as a weed membrane as some companies may suggest. It is to minimise the risk of the stone sub-base migrating into the ground below and weakening the driveway. At this point any drainage systems should be installed, including a soakaway, aco drainage, surface drains, French drains or new manhole covers. Current legislation requires that all surface water from your driveway must not be allowed to run off onto the public highway. If your new tarmacadam driveway falls towards the pavement or road, rainwater must be diverted through surface drainage channels and into soakaways. Our installers provide some of the most competitive tarmac Paving Prices in the UK. A stone sub-base consisting of Type 1 MOT or crushed stone should be compacted down to a 100 mm thickness. This is levelled to the contours of the land, taking into account surface rainwater flow to the drainage systems. Kerbs or edging stones need to be concreted into position and haunched on the outside. This is to protect the tarmacadam driveway from breaking up under the weight of cars. 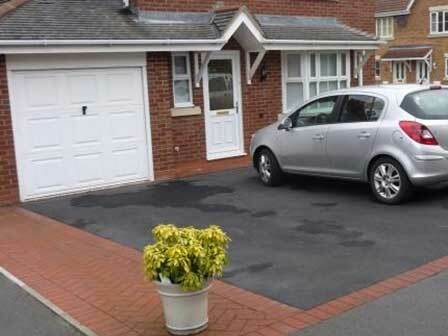 In the image shown, kerb stones are required because the garden area is higher than the driveway. A bitmac sub-base, sometimes referred to as a binder course, is laid and compacted down to 50 mm thickness. The bitmac sub-base is a bituminous mix with 20 mm to 30 mm hard stone aggregate. Compared to the final wearing course of tarmac the binder course appears quite rough in texture. The bitmac wearing course with hard stone aggregate should be at least 30 mm thick after being well compacted with heavy machinery. The size of the stone aggregate is determined by the intended use of the tarmac surface. 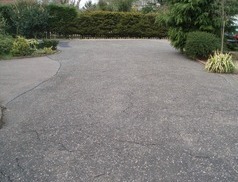 If it is a foot path or domestic driveway for cars only, 6 mm aggregate is acceptable. However, if you use your driveway for vans and heavier vehicles, the final wearing layer of tarmac on your driveway should have a 10 mm hard stone aggregate for a more durable surface. Complete the online form today for competitive Tarmac Paving Prices. If the bitmac wearing course is installed during warm or hot weather, the curing process is helped by sprinkling water from a hose pipe over it to cool and harden it. 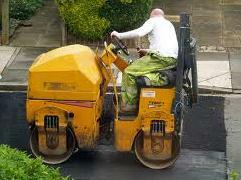 Most domestic tarmacadam driveways, footpaths and patios are referred to as ‘hand-laid and machine rolled’. This means that the two bitmac layers are applied to the surface, spread out by hand with rakes and then compacted, or rolled. Installers will normally use a double drum Bomag type, ride-on compactor to compact the hot bitmac. A vibrating plate compactor may be used in areas which are difficult to access but should not be used for the main driveway. Tarmac Paving Prices will introduce you to expert paving companies which will be able to advise you about all types of paving and provide quotations on a range of options. Tarmacadam is an ideal paving product for domestic driveways. It is relatively easy and quick to install (by expert contractors with the correct machinery) and provides a professional, clean appearance to your driveway. 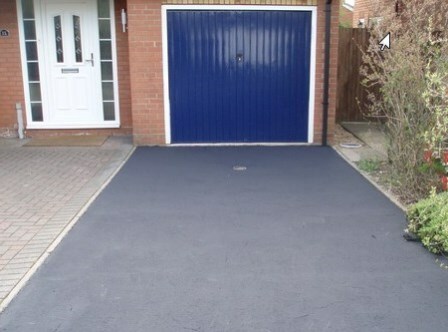 Tarmacadam driveways are extremely durable and long lasting. You can also personalise your driveway with block paving edging and inlay features. 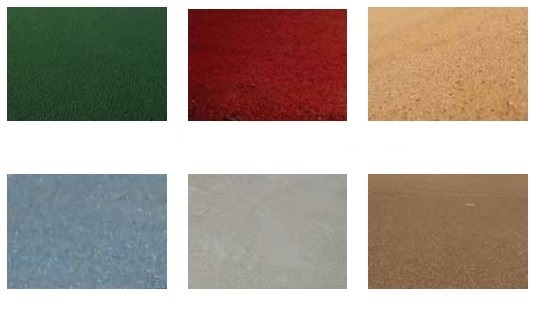 Or, choose coloured tarmac in a range of colours including red, green and blue. 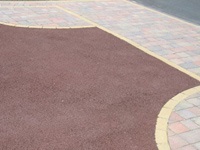 For large driveways where dealing with large amounts of surface water run off would be a problem, Permeable Tarmac is also available from Tarmac Paving Prices. 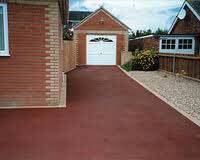 A Coloured Tarmac Driveway is an ideal alternative to other traditional types of paving such as block paving and pattern imprinted concrete. The Mastertint™ range of coloured tarmacadam from Tarmac™ is available in red, blue, green, natural, buff and white (which is actually a pale grey). Tarmac Paving Prices works with installers of coloured tarmacadam across the UK. Permeable tarmac allows surface water to soak through the various layers of macadam through to the ground below. This means that large driveways should not need as many surface drainage channels known as aco drains across them. Permeable tarmac was developed to address the requirements of current legislation which is designed to prevent homeowners from allowing rainwater to run off onto the public highway. Tarmac Paving Prices works with installers of permeable tarmac across the UK. When tarmacadam is properly laid, with a good sub-base and thick enough layers of base coat and wearing layer, it should offer a durable paved area which will last for many years. However, bituminous products can fade, deteriorate and degrade over time. The top wearing course of bitmac becomes brittle over time and can be damaged more easily with vehicle traffic. 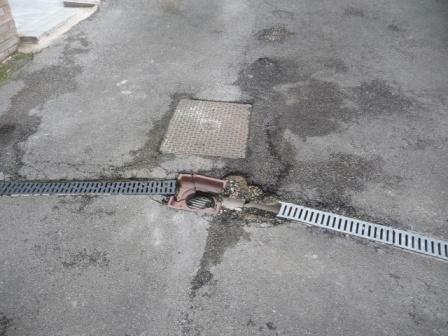 This can lead to cracking of the surface and eventually pot holes. Moss and algae can form on shaded areas of a tarmacadam driveway, especially in winter months when it doesn’t have chance to dry out after rain. Weeds can also find a home in the smallest of cracks in the surface of a tarmacadam driveway and this is not always caused by weeds growing form the ground below. 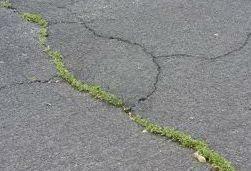 Quite often, seeds blown in the wind will gain a foothold and send their roots down through the tarmacadam surface. To help this, householders should remove weeds as soon as they sprout and apply a weed killer. Being oil-based, tarmacadam can dissolve when lighter oils such as diesel are spilled on the surface. When the surface of a tarmacadam driveway becomes damaged, either through wear or oil spillages the only way to repair it is to cut out an area and replace it with new bitmac. Unfortunately, because the old paved surface will have inevitably faded over time, the new area will be much darker. 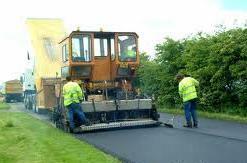 Consequently, tarmacadam cannot generally be invisibly repaired. For this, the whole area will need to be re-surfaced. Coloured tarmacadam is increasing in popularity for domestic driveways and patios as homeowners recognise the advantages of bitmac but want something more attractive than a plain black driveway. 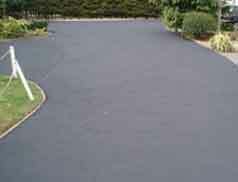 Tarmac™ Mastertint™ is the range of coloured tarmacadam products from Tarmac™, the company. Tarmac™ Mastertint™ replaces the top wearing course of black bitmac and is a blend of coloured aggregate, pigment and clear binder. Tarmac™ Mastertint™ is available in a wide range of colours including green, red, buff, blue, white (more like a pale grey) and natural. Tarmac Paving Prices will introduce you to expert paving companies which will be able to show you examples of their coloured tarmacadam driveway installations so that you can choose the one which suits your home. Permeable tarmacadam is referred to as open-graded bitmac in the trade and is similar to standard bituminous macadam but with less sand, or fines (finely graded aggregates). This allows water to penetrate the surface and drain through to the stone sub-base below. The reduced amount of fines in the bitmac mix means that there are tiny, interconnected but stable air pockets in the layers of macadam, which allow water to pass through. Permeable tarmacadam driveways should be the same cost as standard tarmacadam driveways and offer similar durability for householders. Permeable tarmacadam driveways can have water harvesting systems installed to collect rainwater for later use, which will also reduce rain water run-off. SUDS Legislation (Sustainable Urban Drainage Systems) has been introduced to prevent householders paving over their gardens and causing potential localised flooding problems. When lawned gardens and borders are paved over, rainwater flows more quickly into drainage systems which may fail to cope in heavy downpours. Previously, rainwater would have drained slowly through the ground to the water table, causing less of a problem. Permeable tarmacadam is an ideal solution to satisfy SUDS legislation and reduce the chances of flooding. Tarmac Paving Prices can introduce you to expert paving companies which will be able to discuss the various options of dealing with rainwater and drainage around your home so that you diminish the risks of localised flooding. 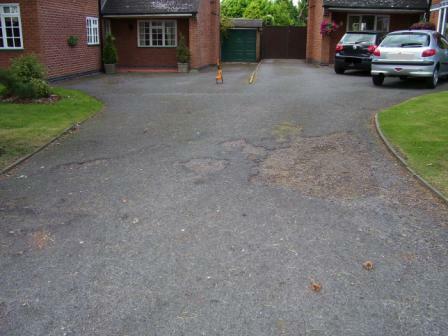 Tarmacadam Driveway: Full Replacement or a Resurface? How do I know whether my driveway needs a full excavation or just a re-surface? How many times have we heard that question? and how do you trust the paving company to tell you the truth? After all, re-surfacing a tarmac driveway should cost less than half that of a full installation. 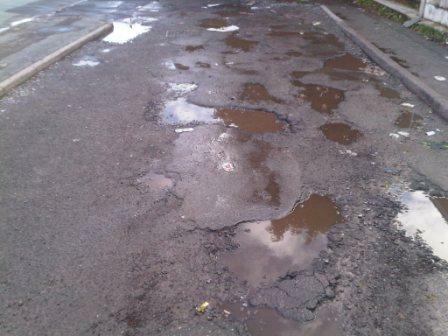 Tarmacadam driveways do wear over time, the surface becomes brittle, cracks form and eventually pot holes develop. If you catch it in time, you could just have your driveway re-surfaced and it will last for many years more. However, if there are quite a few pot holes and the sub-base of stone is exposed in several places, it is probably time to excavate the area and start again, especially if it was installed 15 or 20 years ago. This will involve a new stone sub-base, binder course and wearing layer. How close is the surface of your driveway to the damp proof membrane on your home? It is important not to re-surface a domestic driveway several times. Each time your driveway is re-surfaced the level will rise by around 30 mm or so and this takes it closer to the damp proof membrane on your house wall. There should be at least 150 mm between the top of the driveway and the damp proof membrane to reduce the risk of rising damp. 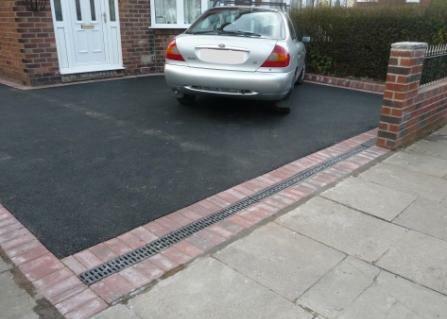 Re-surfacing your tarmacadam driveway just twice will take it to within 90 mm of the damp proof membrane. 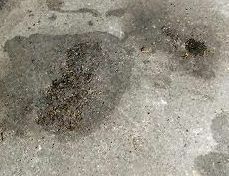 So even if the state of your tarmacadam driveway suggests that a re-surface would be okay, it may not be recommended, if by doing so you risk rising damp affecting the walls of your home. A tarmac installation company introduced by Tarmac Paving Prices will offer best advice, so that you shouldn’t suffer this problem in future. If you are looking to improve the appearance of a faded but otherwise sound tarmacadam surface, it can be restored and refurbished with tarmac paint or tarmac restorer. This will also increase the lifespan of the driveway if the correct product is used and applied properly. Tarmac restorer will re-colour the surface and also seal it to protect against Ultra Violet light which can cause tarmacadam to fade and deteriorate. This may enhance its appearance but it is no substitute to a new 30 mm layer of bitmac applied as a resurface of your driveway. Tarmac Paving Prices will introduce you to expert paving companies which will be able to offer advice about the various types of tarmac paint and tarmac restorer. 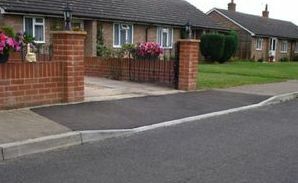 They will discuss with you whether tarmac restorer is appropriate or whether your driveway really should be resurfaced. Stone Mastic Asphalt, more commonly referred to as SMA, was developed to provide a much more hard wearing surface for roads, car parks and industrial estates which take heavier traffic than a domestic driveway has to deal with. Stone mastic asphalt has a very high content of coarse aggregate mixed with mastic which contains bitumen, filler and fibres. SMA is much more durable than tarmacadam and is normally applied in thicker layers to withstand heavy goods vehicles. Stone mastic asphalt is ‘machine laid’ which means that a large vehicle with a compactor at the rear dispenses the SMA onto the surface and then compacts it on the road or car park surface. Commercial areas such as these normally have four layers; a stone sub-base, a sub-base of bitmac, a binder course of bitmac and a top wearing layer of stone mastic asphalt. The layers of stone, bitmac and stone mastic asphalt need be much thicker than a domestic driveway to take the weight of commercial vehicles and high levels of traffic. Tarmac Paving Prices will introduce you to expert paving companies which will offer advice on the specification of Tarmacadam or Stone Mastic Asphalt appropriate for your requirements. 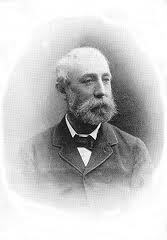 John Louden McAdam is credited with designing roads with broken stones laid in tight patterns. The surface was then covered with smaller stones which had been crushed, to form a smoother road way. McAdam found that grading the stones into various layers and then compacting them gave the best results for a more usable road. McAdam’s road surfacing design became known as macadam roads and it was considered the greatest advancement in road design in the eighteenth century. However, although macadam roads worked well for horses and carriages, the tyres of newly introduced motor cars tended to break the surface up. History surrounding the development from Macadam roads to Tar-Macadam is patchy but the version attracting most credibility involved Edgar Purnell Hooley in 1901. When driving past a factory or works, Hooley noticed that a barrel of tar had spilled onto the road and someone had covered the resulting sticky mess with stones or slag from a local factory or works. Hooley went on to develop his own mixture of aggregate, cement and tar. He named his new product tar-mac and formed a company to manufacture it. Tar-mac was compacted by a steam roller to form new roads. After little success however, he sold the patent to Sir Alfred Hickman MP who owned a large steel works and who now had a use for the waste slag it generated. Hickman named his company Tarmac Limited. And that, as they say, is history. Today, the enlarged company is a multi-national business supplying aggregates, asphalt, cement and ready mixed concrete around the world. However, the company still has a base in Wolverhampton where Sir Alfred Hickman MP established his business. In its basic form however, tar-mac was affected by changes in temperature and asphalt, a by-product of petroleum manufacture, took over. Today, on roads, large car parks and industrial estates, stone mastic asphalt is used to provide a stronger and more durable surface. Complete the form on this page and Tarmac Paving Prices will put you in touch with up to four tarmacadam companies to provide competitive quotations with no obligation. For competitive quotations on a wide range of other home improvements, including replacement windows and doors, conservatories and orangeries, roofing and renewable energy heating systems, visit our ‘Just a Quote‘ website.